Has Anyone Lost this Friendly Dog? Could you be the next Acton Market Trader? Inspired by the History of Acton Transport? Yesterday, Sunday April 15th, on Goldsmith Avenue near the corner with Baldwyn Gardens this very sweet-tempered male spaniel was found wandering. Amanda Fitton, the Acton resident who found him, contacted the Mayhew Animal Home who thought they had heard from his owner. However, when Amanda got the dog to the charity run home in Kensal Rise it became clear the owner in question was looking for a different dog. The Mayhew Centre will keep him for a week before finding him a new home. The found dog is a King Charles Cavalier Spaniel. 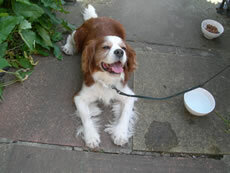 He has classic russet and white markings and is probably aged around 10. If anyone has any information about him, please contact editor@actonW3.com. For further information about the Mayhew Animal Home visit: wwww.mayhewanimalhome.org.